Cannot set 2nd and 3rd dial. The watch is beautiful. This August Steiner timepiece epitomizes class and elegance in its design. The dial is home to Roman numeral markers, three sub-dials and slick alpha style hands. 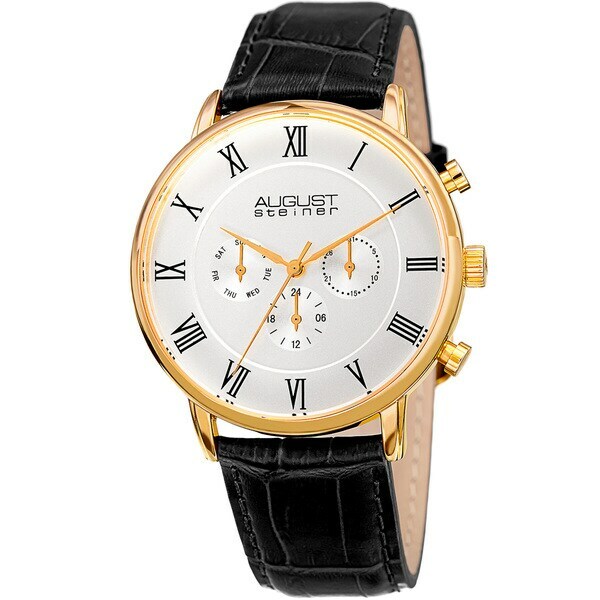 Powered by a Swiss quartz movement, this watch is completed with a genuine leather strap. watch does not have a second hand nor date is not complete with all roman numerals. I purchased this watch to wear for work, but it's almost too nice for work. The detailed precision is amazing. The leather is extremely soft and comfortable. August Steiner has exceeded expectations with this watch, truly exquisite. Very quality leather band and nice time piece. Good looking watch! Leather band looks more cordovan than brown, which I like. This watch is stunning on the wrist and you will a lot of compliments about how rich it looks. Told my friends and siblings that go to overstock.com and you would get more than your money’s worth . Great watches for casual and party atmosphere. Both watches are very nice looking, but the free gift stopped keeping time after less than two days. Looking for a watch with a large face, I finally found this one on Overstock. Can't begin to tell you how good it looks on my wrist......bellisimo! Very elegant looking and people give me nice comment. The price is good. Considering how affordable it was this watch is one of my better purchases from Overstock. Let me add that it is very reliable but above all breathtakingly beautiful. "When will I receive the watch"